Graduation cap candy pops by Bakerella – these were an instant classic when Bakerella introduced them in 2009. Who could resist them?! They’re so cute (and delicious). 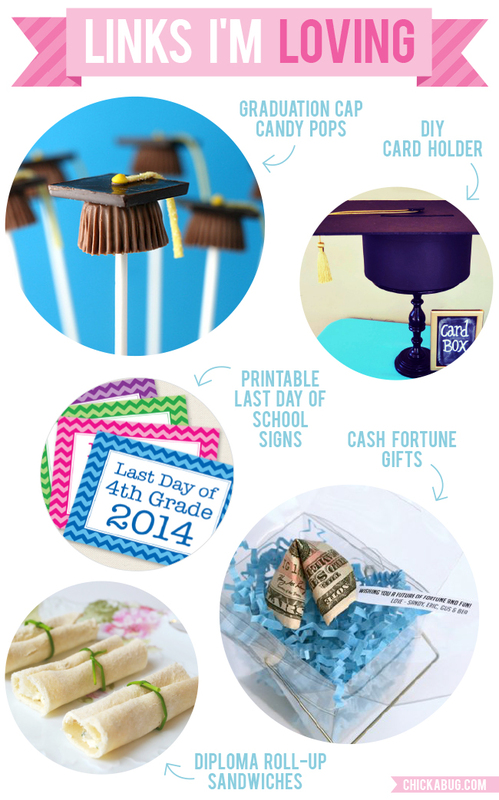 DIY graduation cap card holder by Oh It’s Perfect – there are instructions for how to make these in the comments section. Printable last day of school signs by Chickabug – for fun photo ops! These include every grade from Pre-K through 12. Cash fortune graduation gift by Project Denneler – money pretty much makes the best graduation gift, doesn’t it? It will be far more memorable and special presented like this! Diploma roll-up sandwiches by Sweetology – cream cheese sandwiches rolled into little diplomas and tied with chives. Clever! Shop for personalized last day of school paper goods and printables here. Or, check out more last day of school ideas on Pinterest or here on my blog!